The Obama government has provided an incentive for first-time home buyers who purchase homes from the start of the year until the end of November 2009. They may be eligible for a tax credit based on 10 percent of the value of the home or $8,000 (whichever is least). Remember a tax credit is very different from a tax deduction – a tax credit is equivalent to money in your hand, as opposed to a tax deduction which only reduces your taxable income. It’s important to remember that the $8,000 tax credit is just that – a tax credit. The benefit of a tax credit is that it’s a dollar-for-dollar tax reduction, rather than a reduction in a tax liability that would only save you $1,000 to $1,500 when all is said and done. So, if a home buyer were to owe $8,000 in income taxes and would qualify for the $8,000 tax credit, they would owe nothing. Better still, the tax credit is refundable, which means the home buyer can receive a check for the credit if he or she has little income tax liability. For example, if a home buyer is liable for $4,000 in income tax, he can offset that $4,000 with half of the tax credit, and still receive a check for the remaining $4,000! February 2009 - Click image to enlarge. The 2008 Tax Credit of $7500 has to be paid back at $500 per year for 15 years with no interest. 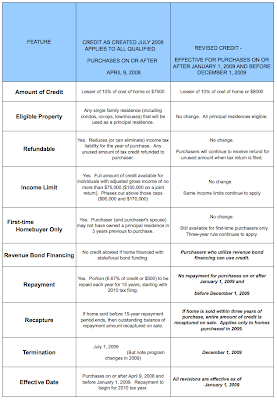 The 2009 Tax Credit of $8,000, does not have to be repaid, unless you sell the home again in under 3 years. Basically, if you are a first time home-buyer, and you purchase a home anytime from Jan 1 - Dec 1, 2009 (NOTE that is is NOT Dec 31! ), then you qualify for the $8,000 tax credit.